I do believe that if you have the right intel about you’re enemy you’ll have more resources to fight efficiently against it. This time the intel I wanted to gather and inform you about it’s from stress and how it’s linked to depression, in that way we can discover its weak points to leverage them and finally become free from both. According to medicinenet.com in a medical perspective, stress is “a physical, mental, or emotional factor that causes bodily or mental tension and can cause the flight-or-fight response in us.” And according to Dr. Hans Selye in The Nature of Stress, not all stress is bad for you but depends more on how you perceive any “stressful” situation. Stress can be caused by information overload, lack of control in a situation, having too many choices, lack of sleep, social isolation, crisis, catastrophes, fear, etc. The less control we perceive we have over our lives, the easier stress dominate us. When we are experiencing stress very often, we become proclive of making decisions in the short term. Everything that we perceive as a threat can affect our biology and everybody has a different level of tolerance of stress, once it’s exceeded, we begin to break down and what we usually believed and liked can become meaningless to us. This means that stress increases our suggestibility. Now, the more in control we believe we are, the more protected we are against its negative effects. In fact, studies have shown that people who perceive themselves as being in control have more commitment to family, work and to being healthy, are less likely to have problems regarding stress. In one side, a mental illness (depression and anxiety disorders in this case) make us perceive everything as worse or even as a kind of threat toward us, at least ten times stronger of what really is. On the other side, having stress over our bearable limits for a long period of time will end up in us catching some kind of mental illness. This explains why army veterans can suffer the consequences of being at war, they easily develop PTSD. Being under the influence of depression will make you see everything as a threat, which means you don’t have control over something and lastly will get more stressed and worn out, you’ll need a lot more energy to do any simple daily task, like brushing your teeth. 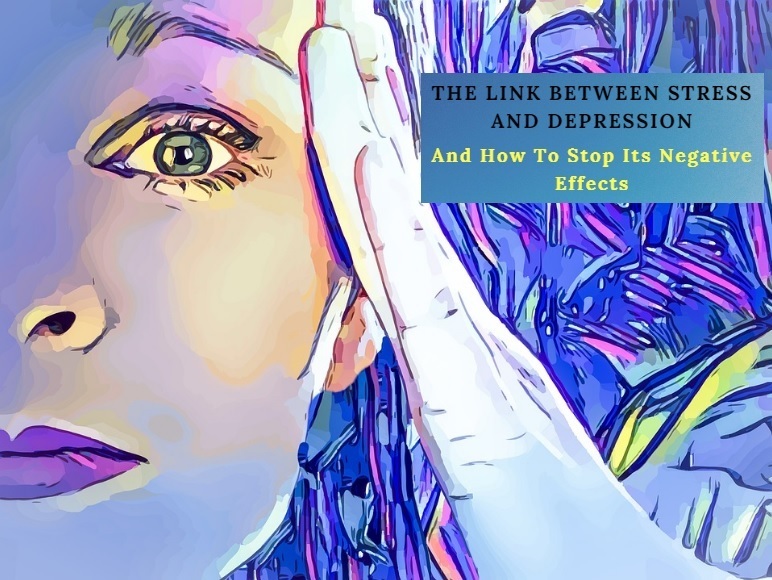 I believe this a simple explanation for the link between depression and stress and it’s the key for beginning to understand how we can fight it. And How We Fight It? Then, how we do it? How knowing this can help us in fighting stress and depression? So far we know that by feeling we are in control, we will be able to resist the negative effects of stress. We have to learn how to manage our threats so we don’t feel overwhelmed when they make their apparition. What we need to do it’s to change the perception of threats to challenges. In this way what we are doing is taking back the power of something dangerous to us, by thinking this is something I’ll overcome, this is just one of the many challenges that will come in my life! That way there’s no reason to feel overwhelmed by the stress because we’re responding in a more positive way, focusing on what we can control rather than on what we cannot. If there’s not anything we can do to change something we cannot control, then why bother with being too worried and overwhelmed? It sounds simple but the real answer is, (and I know we have probably heard it a thousand times now) with a positive attitude you can overcome everything that comes in your life! Mental illnesses (like depression), chemical substances (like drugs), physical and emotional pain can alter our biochemical mechanism (mind) to understand and interpret in a bad way what we perceive with our senses leading us to a state of anger, stress, and fear. Because we cannot rely on our senses and perception under the influence of depression, we need to seek help, and therapy it’s always the best recommendation. Now to conclude on stress, it seems that it is neither bad nor good in its nature. But depends more on the situation and the perception (or interpretation if you prefer) of a “stressful” situation. If we can control our attitude towards everything life throw us, nothing will have a major negative effect on us, we will become stress-proof. We must deal with stress every day. We need challenges and learn how to overcome them so we can become in the best of what we can be! Very good advice. At the very worst points one is unable to do anything but crawl under a stone but at more normal times you are right- change your attitude to everything around you. Act as if we can change our lives and our personality even if we can not. Perhaps the biggest danger is self medication – alcohol, recreational drugs. I do think that if a medically prescribed drug alleviates the pain it should be welcomed with open arms however! The problem I do have with antidepressant drugs (and pill cocktails) is that they create a dependency on them and in the long run, you’ll find is not a cure but the appeasement of the symptoms.